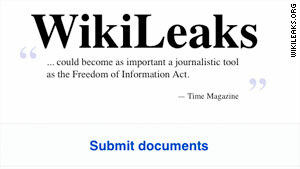 WikiLeaks is known for posting classified documents and video on its website. (CNN) -- For a website devoted to exposing secrets, WikiLeaks.org is pretty good at keeping its own. Not much is confirmed about exactly who founded it and runs it, who donates money to allow the five or so full-time people and hundreds of volunteers to keep it going, and where it all happens. Despite such murkiness, WikiLeaks has gained international notoriety since it started posting classified documents and other secret information from a European base in January 2007. In April, video of a U.S. military helicopter strike in Iraq that killed two Reuters journalists raised questions about the attack, as well as how WikiLeaks got the military tapes. Now, rumors abound that WikiLeaks is poised to post more video of Americans at war, perhaps involving U.S. air strikes in Afghanistan that killed civilians and prompted a military report critical of what happened. The Pentagon has taken notice. In a secret 2008 report leaked to WikiLeaks, the U.S. Army Counterintelligence Center called the website a potential threat to U.S. forces and counterintelligence efforts. "Recent unauthorized release of DoD (Department of Defense) sensitive and classified documents provide FISS (foreign intelligence and security services), foreign terrorist groups, insurgents and other foreign adversaries with potentially actionable information for targeting U.S. forces," said the report posted on WikiLeaks. To Julian Assange, the website's director and only public face, it's all about providing information necessary for citizens to make decisions that shape their future. "All the information in a society, all the happenings in a society, is relevant to choosing to support" a government, political parties and particular leaders, Assange said in an interview posted on WikiLeaks on June 1. More revealing was an April interview on the U.S. comedy show "The Colbert Report," in which Assange acknowledged to host Stephen Colbert that the goal of posting secret documents was to gain the "maximum possible political impact." For example, Assange told Colbert, he titled the video on the Iraqi helicopter strike that killed the Reuters journalists "Collateral Murder" because, he said, that's what happened. At the same time, Assange said, WikiLeaks always provides to the public all the video or documents available so that viewers can decide for themselves. "If people have a different opinion, the full material is there for them to analyze and assess," Assange told Colbert. WikiLeaks publishes anonymously submitted documents, video and other sensitive materials after vetting them, it says. It claims never to have fallen for a forgery. A scouring of Internet sources found some basic information about the website, including that it was started by a group of activists that included Chinese political dissidents and it survives on donations. Assange, an Australian journalist depicted in media reports as a former computer hacker, described WikiLeaks in a January interview as run by five or so full-time people supported by hundreds of volunteers. His work with WikiLeaks won Amnesty International's 2009 UK Media Award in the new media category for "Kenya: The Cry of Blood -- Extra Judicial Killings and Disappearances," a suppressed report on police killings by Kenya's National Commission on Human Rights. In the January interview posted on the Medien-Okonomie-Blog, Assange described an almost covert operation with no headquarters that needs roughly $300,000 a year to function as a mostly volunteer organization. "But there are people who can't afford to continue being involved full-time unless they are paid," he said, estimating the costs would approach $1 million year if that happened. He explained the value that WikiLeaks provides to the mainstream media by publishing otherwise unobtainable information. "We take the most legally difficult part, which is not the story, but usually the backing documents," Assange said in the interview. "As a result there is less chance of legal action against the publisher." For its own legal troubles, Assange said, WikiLeaks relies on lawyers donated by mainstream media outlets including The Associated Press and the Los Angeles Times. The website's biggest U.S. splash was the April posting of what it said was video from a U.S. helicopter involved in an attack in Baghdad that killed nine people -- including the two Reuters journalists -- and wounded two children. A U.S. Army intelligence analyst was arrested two months later, allegedly for leaking classified military information, the U.S. military said. The website Wired.com identified him as Spc. Bradley Manning, 22, and said he had leaked the video of the helicopter assault. Public airing of the video forced the Pentagon to defend the actions of its troops in a report that concluded the Apache helicopter crews had no way of knowing the journalists -- Namir Noor-Eldeen and Saeed Chmagh -- were among suspected insurgents on the street. Now Assange is described as living on the run, and the Iceland Parliament has passed a proposal intended to make the country a haven for whistle-blowers such as WikiLeaks.